I wasn't quite feeling up to an interview when they were doing sign-ups so instead I'm going to take this opportunity to introduce you to a few of my favorite bloggers! If I'm looking for someone who is possibly reading the same thing as me or else is reading something that I should be reading, I turn to Karen of Books and Chocolate. If I want an intelligent and honest discussion about any book, I am guaranteed just that from Teresa and Jenny of Shelf Love. 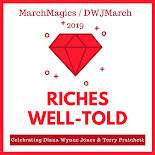 If I need to read the posts of someone who writes with a southern accent, loves Diana Wynne Jones and is always amusing, I seek out Jenny of Jenny's Books. If I need a belly laugh and some healthy snarkiness to perk up my day, I can always count on Jenners of Life ... With Books. If I'm feeling isolated and too stuck in my American ways, I get some direction from Natalie (Tanabata) of In Spring it is the Dawn. If I want access to awesome giveaways and need to keep up with the best children's books out there, I can never go wrong with Danielle (The1stDaughter) of There's a Book. If I want a friend who also spends her time with one foot in the adult book world and the other in the kids' one, I head over and visit Tif of Tif Talks Books. So, head out and meet some of these fine people today and tell them I sent you! Thanks for these suggestions! I'm going to get post together with mine as well! This is a great list, containing many of the bloggers I follow as well. Thanks for sharing! I think a lot of bloggers/readers are introverts, but it is a solitary hobby. By the way thanks so much for the "shout out"; I enjoy your blog as well. I really liked how you wrote this post. It was short and sweet and to the point but told me just what I needed to know. And thank you for mentioning me and my blog!!! Snark rules! Thank you so much for the mention--always nice to be included alongside other excellent bloggers. Ahhh...you're fabulous! Thank you so much! Among some other great blogs and some I need to take a look at. Thank you thank you! Yet another post that I neglected commenting on, but I am here and saying thank you once again! You are so kind!! I need to explore a few of these mentioned because I have not discovered them yet!